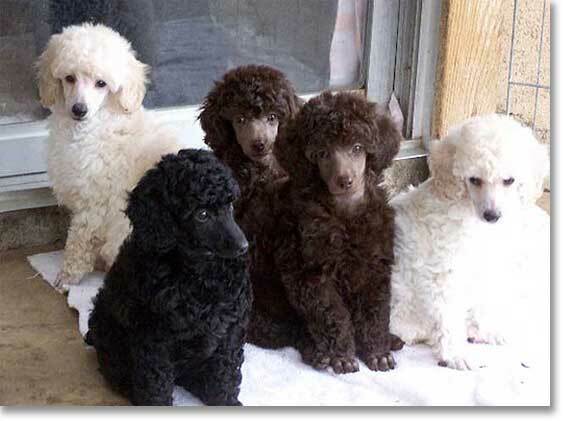 The Poodle breed is a remarkable breed, not only are they of a breed that can satisfy many different owner needs as to ability to perform, come in different sizes but they come in many different colors. At Bar King we raise black, brown and white Miniature Poodles. You will find Poodles competing in the field, acting as therapy dogs, excelling in all levels of obedience, taking top honors in agility and conformation. Most importantly, they make the ULTIMATE companion dog...just a good, loyal, reliable friend. Our poodles are terrific companions. They are extremely intelligent and very perceptive. We find ourselves spelling words instead of saying things outright! We spend a lot of time with our Miniature Poodles, maybe that's why we perceive them as reading our every thought. Can't say enough about this breed, the Miniature Poodle is the ULTIMATE PET.